Outside the Great Ketchum Tag Sale held at the nexStage Theatre last weekend, it was love at first sight. 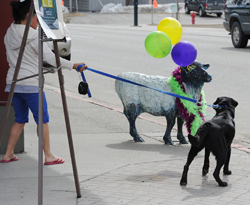 Oreo the black Lab pulled her owner across Main Street to sniff noses with a sheep sculpture dressed with flamboyant boas and adorned with balloons. Oreo wanted to stay and socialize but then it was her turn to be pulled away. How can we be more pedestrian-friendly? Although payment is deferred, the city’s interest is secure.